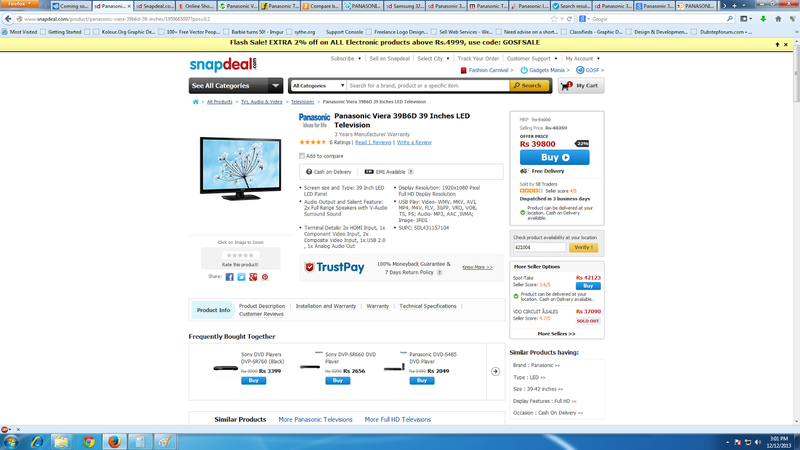 Recently I ordered a Pansonic Viera 39B6D LED TV from Snapdeal and the process was not smooth. Although the product was delivered in 5days via Gati Courier (Delivered on Tue Dec 17 00:00:00 IST 2013) the service was not upto the mark, especially the customer service agents were pathetic. One needs to read the return process and other conditions before ordering a product. Especially if you are ordering any electronic products. Trustpay does not offer refund on electronics, but it may replace the product if there is any manufacturing defect. The worst part is the customer service agents. 90% of them are really rude when you ask extra information about the product. They are like trained parrots, no matter how angry you are and what you are saying, the customer service representative say “I’m really sorry for the inconvenience and our team will look in to the matter“. They don’t give you a resolution on the call, nor they escalate the call even if its requested by the customer. Their supervisor is never available on call. Some agents put your call on hold for silly reasons like checking the product price or model number. Such things can be done while talking to the customer as well. If you are really angry over something, some agents may place you on hold after taking you permission and then release calls. If you call back and complain they apologize and say its a technical error. They are really not interested in serving the customer , their sole intention is to earn profits. They promise a lot of things on the call but after the product is delivered, they deny it completely. Before ordering the product, I called Snapdeal customer service many times and all of them told me that if I don’t like the product or picture quality etc, the product will be replaced, and no questions will be asked. I got fooled by the TrustPay advertisement . It was my mistake that I did not click the read more link which has all the hidden conditions. I’m really angry with their customer service as they provided false information. The LED TV was delivered undamaged with good packaging. But when I turned on the TV I was not impressed with the picture quality. Then I played HD movies via my Pendrive and I found that Black areas in the picture are not really black, its all grainy. I was not satisfied with the picture quality hence, I called them and they said , the issue has been escalated, but they nothing much was done. They simply raised a complaint with Panasonic tech support. The Panasonic guy said its good and this how it is even though I showed him the black areas in the picture. I’m really disappointed the way Snapdeal was dealing this entire situation. They then denied replacement or refund. I even asked them if I can pay some extra and get a SONY LED TV, but they denied that as well. Finally, I had no choice so I installed the TV and wrote an article about Snapdeal’s TrustPay. The article was retweeted by many on Twitter. The next day, I got a call from their office asking me the difficulties I faced and is there anything they can do to please me. The lady asked me if I wanted to replace the product. The product was delivered on 17th Dec 2013, and on 26th the issue was closed by Snapdeal itself, and then I got a call on 2nd Jan 2014. But it was too late now as I had already installed the TV and replacement or refund was out of the question. I have ordered a lot of products apart from electronics from Snapdeal, but this is the first time I faced such a big problem. So I will never buy electronics from them. Take a screenshot of the product page with the system time as you will find the warranty details etc on that page. They keep updating the page regularly. When I ordered (During GOSF) , the page advertised 3 years warranty but I only got 1 year warranty. They haven’t answered my email as well. Call up customer service and inquire each and everything. Make sure you record the call. Don’t buy TV , Music System ( my personal advice) online as its always better to visit your local market. I won’t completely avoid Snapdeal but will take precautions and will never buy costly electronics online especially from Snapdeal. I had a very bad time dealing with them.